M'dirr is a Khajiit commoner residing in the village of Border Watch. He shares his house with Tsramla. M'dirr, like all residents of Border Watch, firmly believes in the K'Sharra prophecy, which states that three specific signs will be shown as a warning before the world ends. If you recreate these signs during Sheogorath's quest, he will run around town in fear and panic, continuing to do so until you complete the quest, just like the other townsfolk. Otherwise, he sleeps between 10pm and 4am and then wanders around town all day long. At 11am, he takes a two hour lunch break at the popular Border Watch Inn, located in the southwestern part of the village. M'dirr carries a high quality one-handed blunt weapon (best quality for your level) and a small, leveled amount of gold. Normally, his choice of clothing is typical middle-class attire consisting of a pair of light brown linens, pigskin shoes and a brown shirt. In the latter stages of the related quest, he equips one or two pieces of randomly chosen, leveled light armor which he continues to wear from then on. 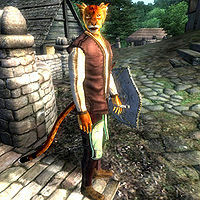 Like all the other inhabitants of Border Watch, M'dirr is a Khajiit of very few words. However, after you have spoken to Sheogorath for the first time, he will point you towards the towns shaman, Ri'Bassa. Esta página foi modificada pela última vez à(s) 03h10min de 18 de julho de 2013.